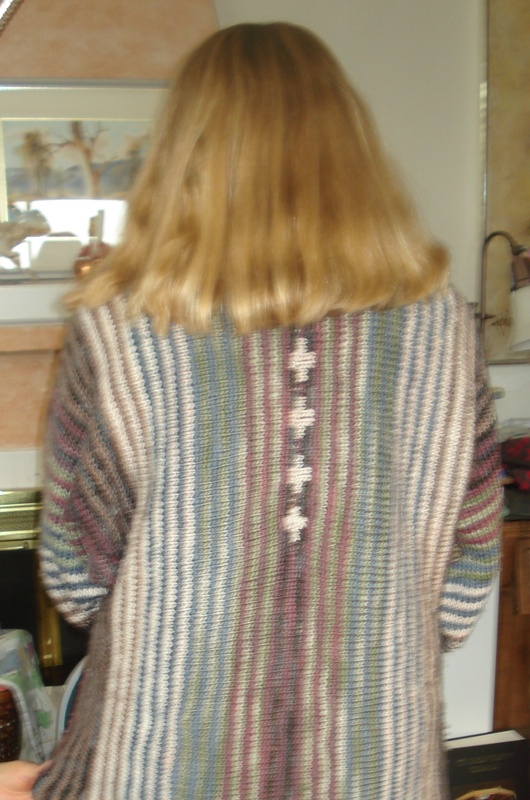 While it’s only been a few days since I posted about Jean and her stealth knitting, this post is about more of her work. 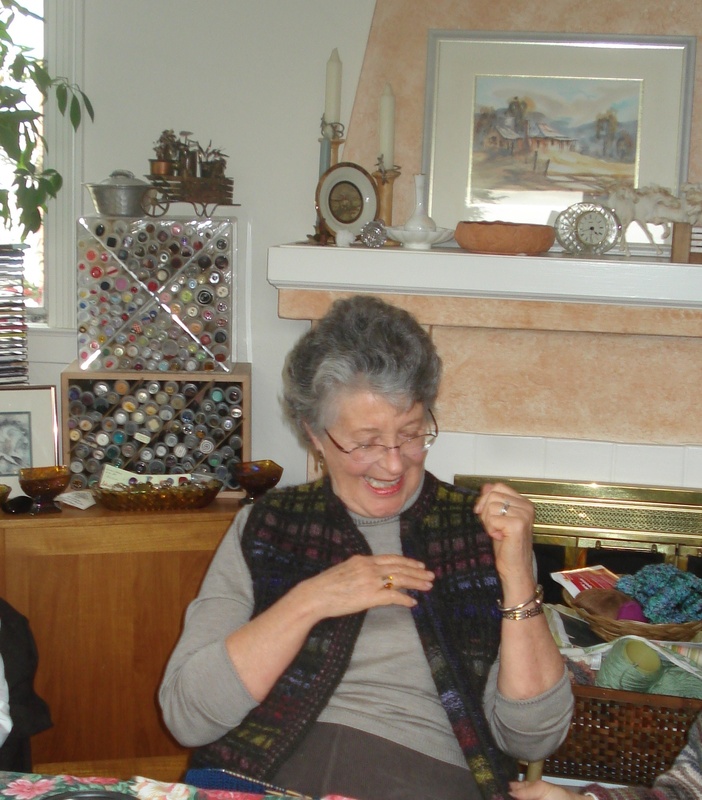 The same day that we saw the ribbon sweater she was wearing a new shawl/scarf – Taygete – a design by local artisan Rosemary (Romi) Hill. I loved the design and the colors. 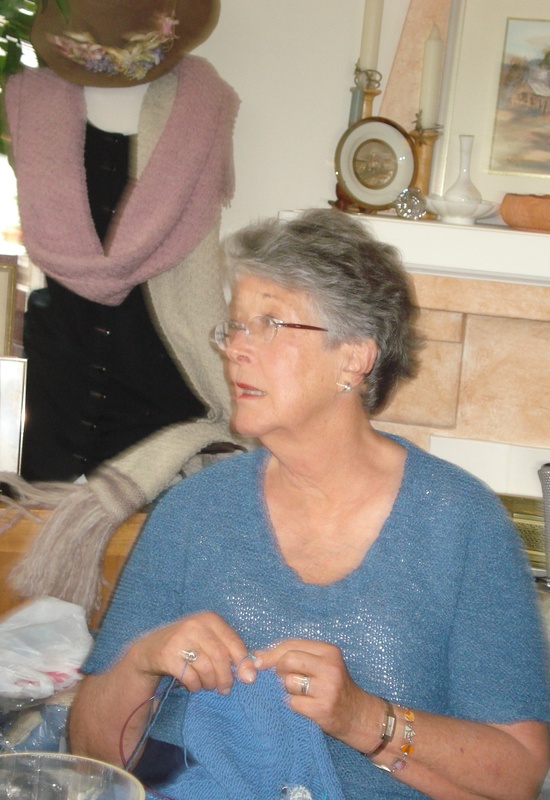 I asked Jean more about her yarn choice and here’s what she had to say. I’ve had a skein of Lisa Souza’s sock yarn in my yarn collection for at least a couple of years that I too bought at Stitches. Jean’s creation has caused me to act. I now have the pattern, I’ve contacted Lisa for a solid yarn to match my variegated Paprikash. I couldn’t find a solid to match…I contacted Lisa…of course she knew which red was used in the variegated….it wasn’t listed as one of the colors on her web-site…she is hand-dyeing a skein for me tomorrow. I am so excited….is that the best customer service?! One more thing! 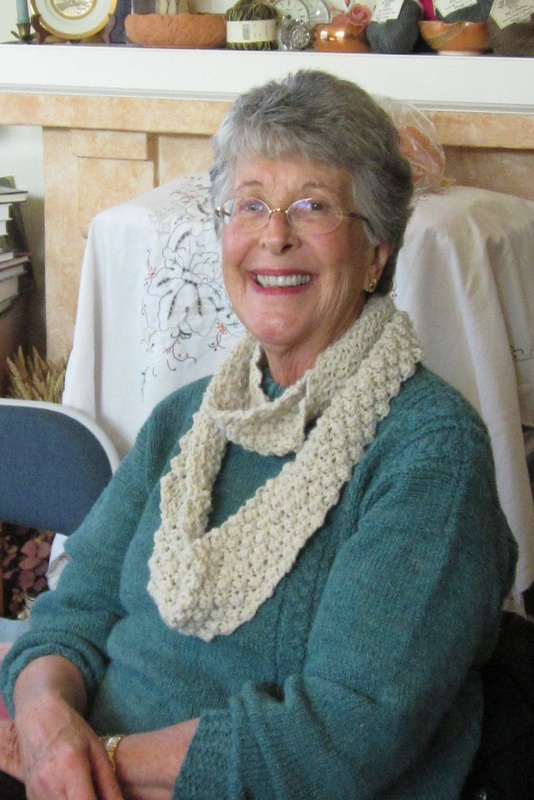 Jean was inspired by a cowl scarf that she recently saw. 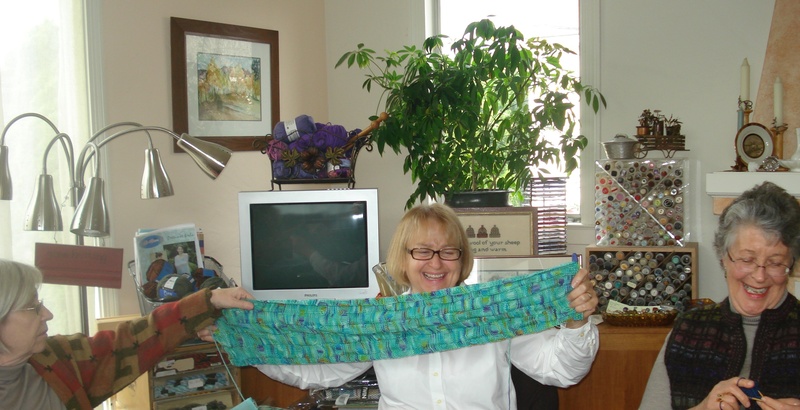 We were able to recreate the pattern…I knew it was a trinity stitch pattern (a multiple of 4 sts)… and Jean knew the size – 5 inches x 56 inches. I love this pattern stitch…..for little effort it creates a beautiful textured fabric. Row 2: *(Knit 1, purl 1, knit 1) all in the same stitch, purl 3 together. Repeat from * across. Row 4: *Purl 3 together, (knit 1, purl 1, knit 1) all in the same stitch. Repeat from * across. Any yarn can be used for this lovely design. Simply work a swatch and determine your stitches to the inch, multiply that number by the width that you want…and round to nearest multiple of four stitches. 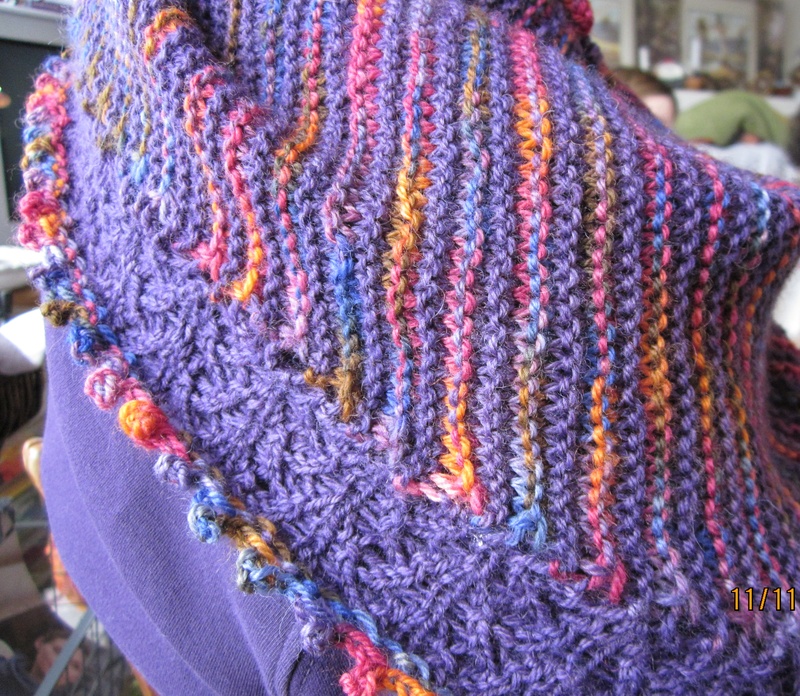 You can finish the project with a kitchner stitch or a 3-needle bind off. While I don’t particularly love doing the kitchner stitch join I do think it’s the best for this project. 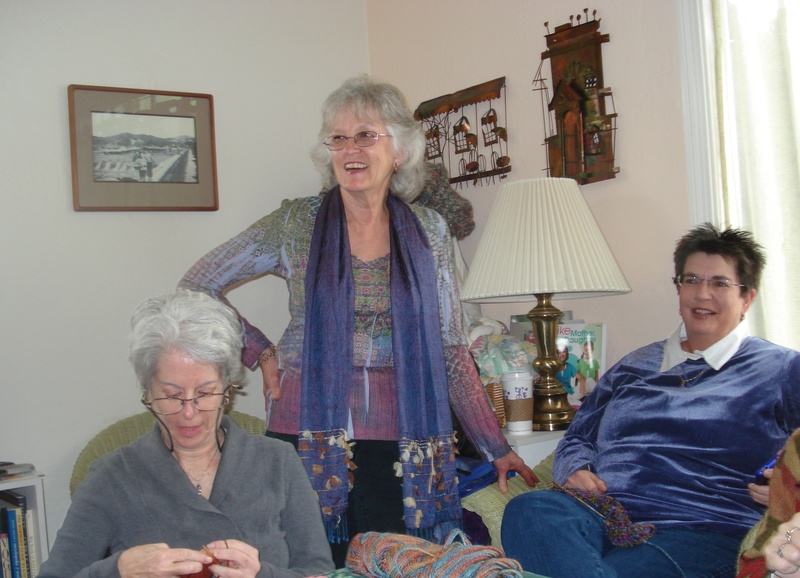 There’s still time to knit gifts for this magical spiritual season! 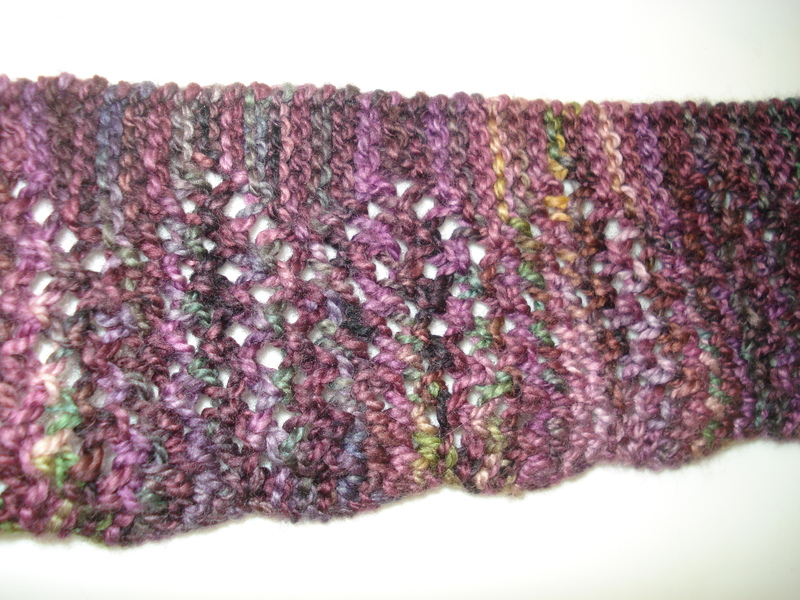 Tomorrow I will post about a simple, quick cowl that many of us have on….and in some cases…off our needles. More on Friday knitting creativity! Posting today was a little fussy! The pictures didn’t want to set up right…so called it a day around 5pm and came back to it just now. There are a couple more photos from Friday that I want to share. 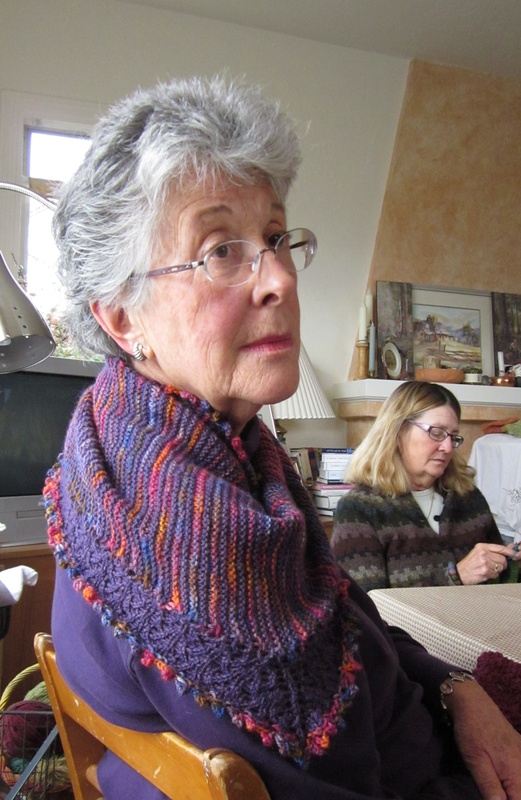 Patricia has been knitting on felted slippers but this Friday she returned to her scarf. She will be sending the info (yarn and pattern stats) shortly. In the meantime, here are the photos. Be sure to click through on the photos so you can see a full shot…particularly the one of Patricia. 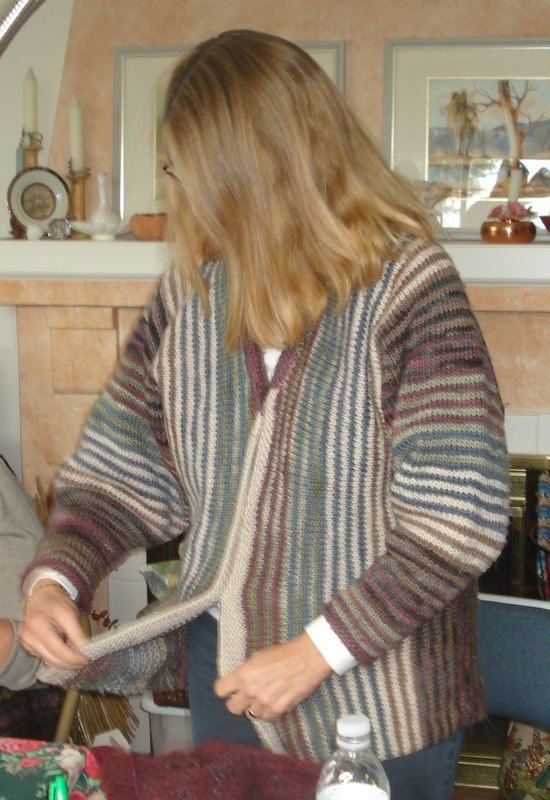 Jean was wearing a window-pane patterned vest that she made some time ago. She is describing the “steek” for us. The next photo is me in a non-knit…but wearing a Christmas gift from my nieice and it got rave reviews from the Friday group. Thanks a bunch. And I am excited to report that I have completed two projects this past week…a basic black scarf for 15-year old nephew Dan and a slouch hat for soon-to-be 12 yr old Sam. The photos will follow in the next few days! Yeah…I can hardly wait to pick up the needles of another UFO. This past week plus has been one of celebration of a birthday and one of many finished projects. Let’s start with Kimberly’s BD….would like to share a lot of photos about this gathering for drinks and some of us stayed for dinner. She was so excited with her new I-phone that she was taking photos left and right. I tried to get one of her but apparently I was having too much fun myself! Apparently, I thought it was not a good photo…it’s gone! So just trust me….she was having a good time! The following Friday we gathered at our ususal knitting workshop time and as usual many items on the needles…come done…and some in process. Here are just a few of those items. Jean used Crystal Palace’s Merino 5 (which she purchased at K2tog in Albany) and she used Ann Norling’s Kid’s Basic pullover pattern. 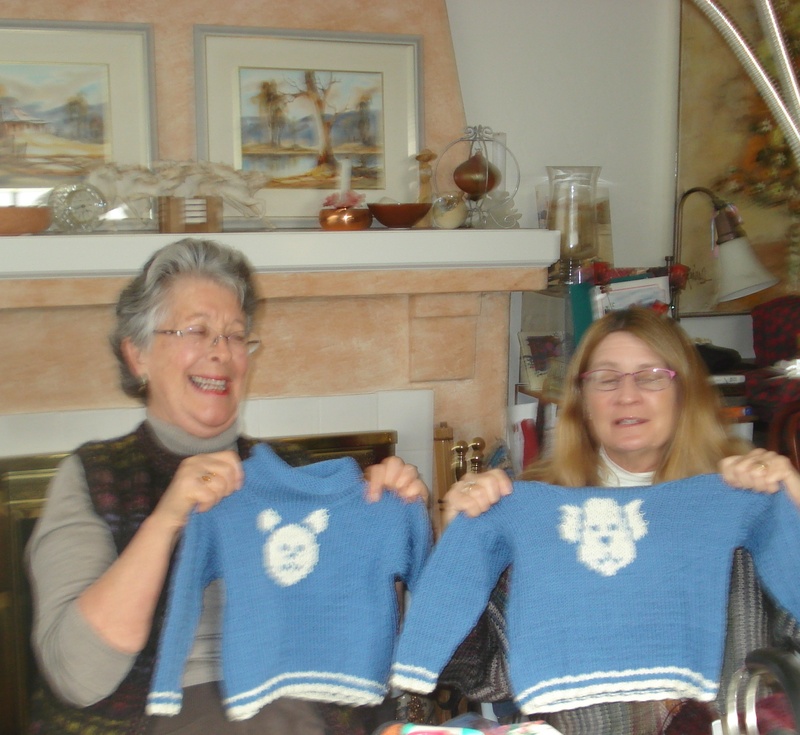 The animal faces were from Interweave’s “Knitted Gifts… a great book says Jean! 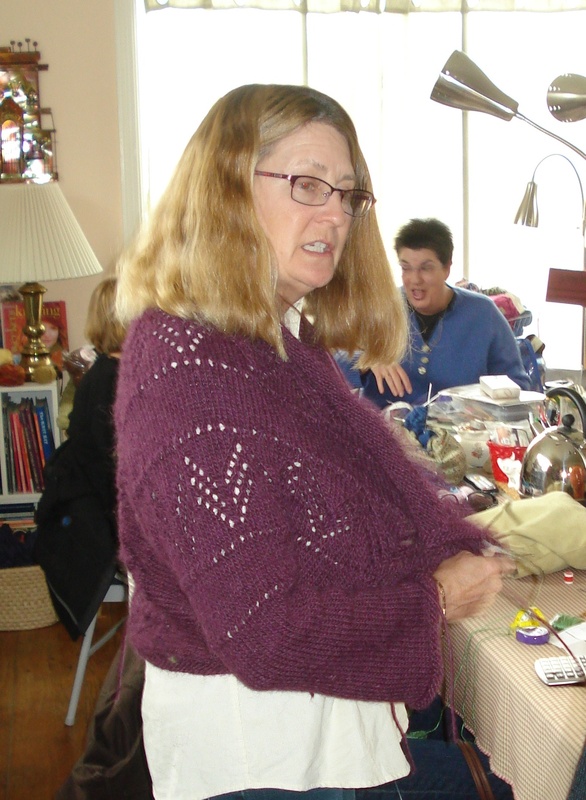 Sarah was wearing a sweater that she made some ago….and we were all enthralled. Sarah tells us, “The pattern is from a Manos del Uruguay booklet – the Design Source Collection # 1. This one is called The Pinstripe Jacket”. She looked lovely in this lovely (yes…I know it’s a play on words) design. Notice her face is not showing…she did say she doesn’t like to photo pose…but the design is so great that we must show. And here’s Sarah!